How to apply for PAN (Permanent Account Number)? It is very easy to apply PAN in India. 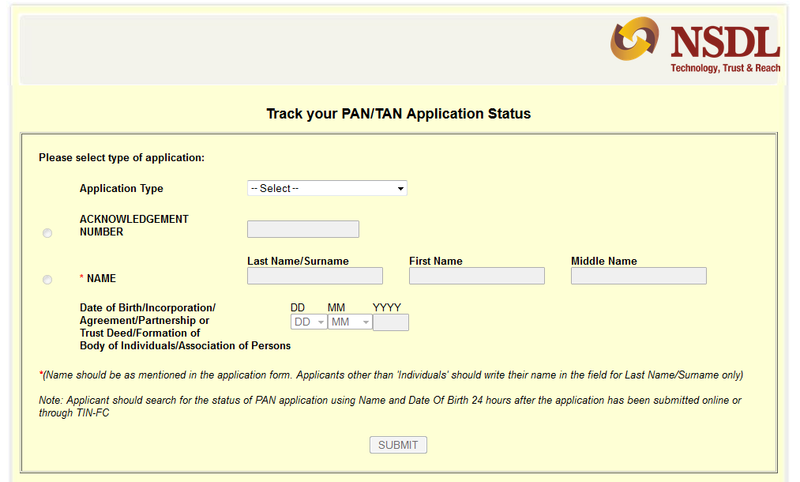 PAN application process is very simple and available in both online and offline mode. It is also time bound process. Within 15 days, one can get PAN easily. Income tax dept. has authorised UTISL (UTI Investor Services Limited) and NSDL (National Securities Depository Limited) to provide the services of PAN application processing. Offline Process: One can visit website (given at the end of post) of these companies and download the form, as applicable, attach ID and address proof as mentioned in the form itself. After that, visit to their one of the centers (centers list available on their website) to submit the form with the fees (which is approx. INR 105 for delivery in India). After 15 days, PAN will be delivered to the address mentioned by you on form. Note: If delivery of PAN card is outside India, fees amount is approx INR 971 in both cases. In the application type, select PAN – New / Change Request. After this, either enter 15 digit Acknowledgement No. (this number is received when you apply for PAN) or Name and DOB. Click submit. You will get the status of your PAN on the screen. In the application type, select New Application (F49a). After this, enter Coupon No. (this number is received when you apply for PAN). Click submit. You will get the status of your PAN on the screen. When you are going outside India to permanent settle there and you do not have any property, Bank A/c, etc whatever may have tax impact, in India. You are also of the view that you will not have any money related dealing in future which will have tax impact in India. You can apply for surrender/ cancellation of PAN of another person when that person is no more and all the money related settlement has been completed. In such case, you can write a simple letter to Assessing Officer (AO) giving all the details and reasons for cancellation. If he is satisfied with the reasons, he will proceed with cancellation of PAN. However, it is very difficult to get the PAN cancelled/ surrendered. It entirely depends on the AO. Change is the information given by you while applying PAN. For example, a person has shifted from one house to another house which results in change in address. Error in printing of PAN. This normally happens when one apply for PAN offline. When someone apply offline, officials at PAN centres entering the information in the software may read the some words incorrectly and therefore results in error. For this, you need to fill up this form. Besides the above reason, same form can be used for the following purposes. This is called reprint of PAN card. In case you have lost your PAN card, you can apply for the same PAN card again without any change in information. You may need new PAN card as old PAN card is damaged. This happens due to wear and tear. You have not received your PAN card. You just want new PAN card. Procedure is almost same as in the case of application for new PAN card. Offline Process: One can download this form, attach ID and address proof as mentioned in the form itself. After that, visit to one of the centers of NSDL to submit the form with the fees (which is approx. INR 105 currently for delivery in India). After 15 days, PAN will be delivered to the address mentioned by you on form. Note: If delivery of PAN card is outside India, fees amount is approx INR 971 in both cases as on date. In the form, one click box is given on left hand side for every column. For Changes or Correction – While filling up form for change or correct, click only that box for which you want the information to be updated. Do not click any other box. But you need to fill up the complete form. For Reprint of PAN – In case you are filling up form for reprinting of PAN, do not click any box. Just fill up the complete form and submit. What if more than one PAN allotted to you? One person can have one and only one PAN. Sometimes it happens that you are allotted more than PAN card inadvertently. In such a case, you may be asked to pay penalty of INR 10,000 as holding more than one PAN is an offense. If you receive legal notice from IT department, you will have to pay INR 10,000 as penalty. After moving to different house, that person has applied for new PAN. One person has applied for PAN multiple times and every time, new PAN no. is generated. Fill up the PAN Change request form and mentioned the PAN to be cancelled in item no. 11 (All other PAN/s inadvertently allotted to you). Write a letter to NSDL-TIN or UTI-PAN informing about the more than one PAN and submit the application to their centre. Please include all the relevant information while writing the letter. ** Please check the NSDL / UTISL website for updated application fees and PAN card forms.